Unfortunately I don’t have a three wheel trike lying handily around in the office at the moment, but if I did I would definitely be busy modifying it for a go at this. If you have a spare trike lying around you might be interested in this video showing a new trike drifting sport using modified trikes. Which might well be worth a go if you fancy a bit of an adrenaline rush. 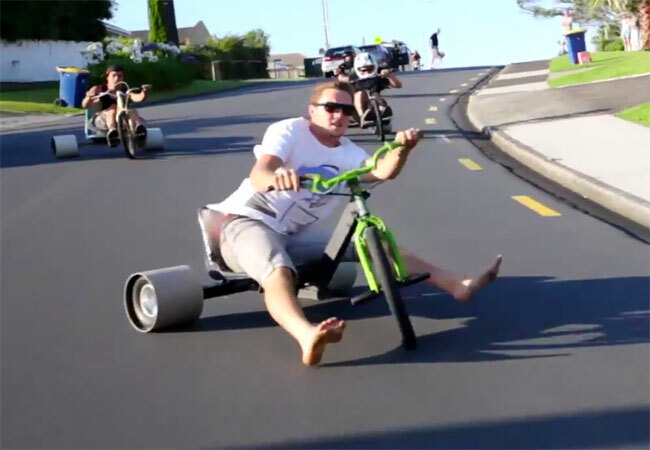 Watch the video after the jump to see the modified trikes in action drifting down a few hills in New Zealand. You can also watch the making of the movie which was created by Devin Graham who filmed the sequence while on a business trip in New Zealand. The tikes rear wheels have been modified wheel using what looks like large drain pipes to provide less friction. So if you have a little spare time this weekend why not modify your trike and head to the hills for a little of adrenaline filled fun.